Each thought, each day, each life lies here as on a laboratory table. And as if it were a metal from which an unknown substance is by every means to be extracted, it must endure experimentation to the point of exhaustion. No organism, no organization, can escape this process. 4 March 2012. Moscow, Russia. (Photo: Nicholas van Beek). The crowd began to erupt with excitement. The Russian rock group Lyube have long been replaced with a speaker delivering a monologue sounding everything like an introduction. Now the older men around me speak quickly to one another, a luminescent wave of smart phones begin to populate my view of the stage and flags bearing His image curl with anticipation in the frozen night air. Vladimir Putin walks on stage and I can hardly believe my eyes. After searching for his image throughout Moscow I had known him but through the stickers projecting his blank stare into the depths of metro stations, through his name ‘Путин’ painted on the walls of underground passages and through the authoritative images formed in the minds of those with whom I spoke. 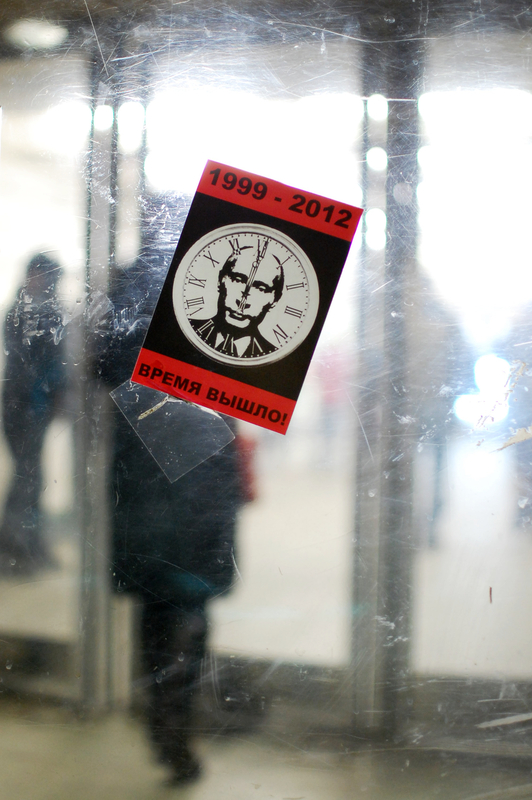 “Who if not Putin?” 2 March 2012. Moscow, Russia. (Photo: Nicholas van Beek). It was 20:50 in the evening of Election Day in Moscow and finally the flickering of these shadows had led to the form itself. He stood above me basking in the slanted rays of spotlight and began to weep. For his country, for his people, for the grace which had entered his body, but most importantly he wept while warning his people that there will be provocations against their will to have him as their leader and that these provocateurs will be dealt with swiftly. “The time has come.” 3 March 2012. Moscow, Russia. (Photo: Nicholas van Beek). For me the afternoon began at a honey festival. 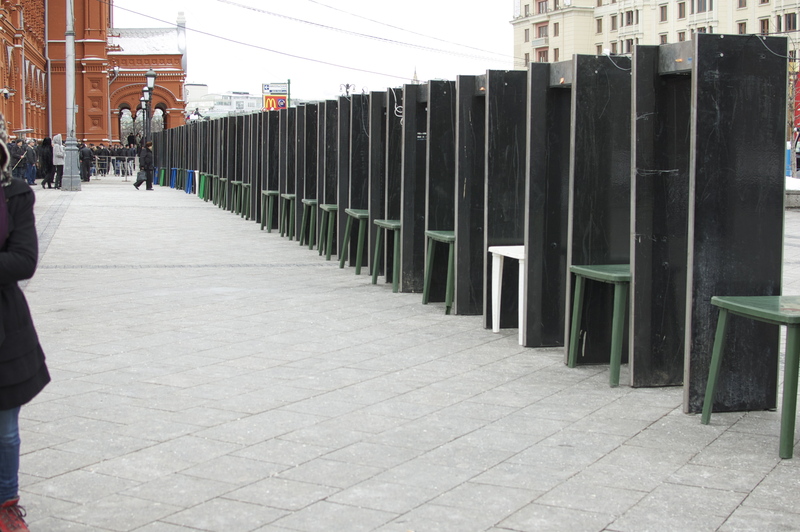 It took place near Red Square and gathered the creamiest, most luscious honeys from around the Post-Soviet region. 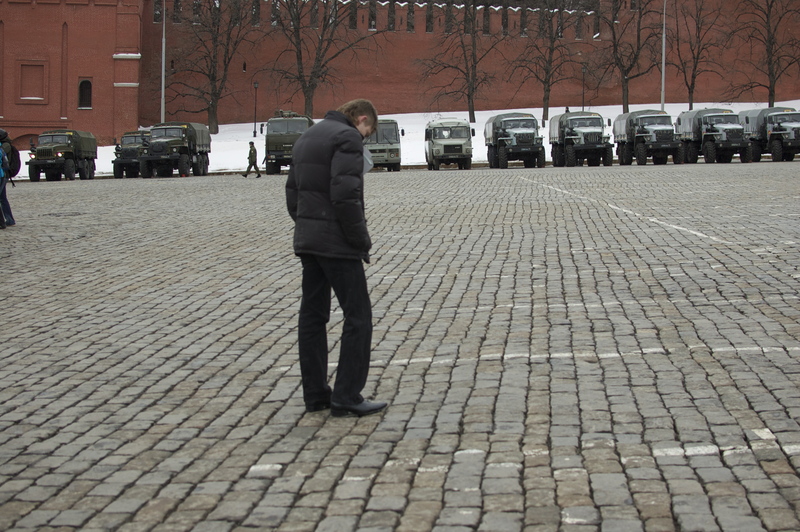 After exiting the metro into the most public area I could name – Red Square – I soon found that much of the open space had been fenced off so I ushered myself inside. There was to be an unannounced concert in the evening and a fortress of bomb detectors and regiments of riot police formed a ring around the celebration zone. Tensions rose in the honey festival when the front entrance was unexpectedly blocked off as the concert security perimeter expanded and honey-filled families became separated by now-closed checkpoints. I had heard of the opposition protests in Bolotnaya Square so with honey-in-hand I escaped the rows of police transport vehicles by crossing the Bol’shoy Kamenny bridge. Instead of provocateurs I found the square surrounded by hundreds of buses with destination signs propped up in the dash and yet another set of barricades blocking off any inclination of a gathering. Next to the buses young adults stood chatting in ringed groups as if on a school trip. These were Nashi, the pro-Kremlin youth organization, who had been granted permission to patrol the streets of Moscow in large groups. They now stood, some smoking, waiting for the order to commence their search for trouble. Some 30,000 Nashi had been bused into Moscow from all over rural Russia to ensure that “nothing happens” on Election Day. They could be identified by the election monitor badges hanging from their necks and the dress of the boys who wore group-specific pointed black dress shoes, some kind of black jacket, usually leather, with the ensemble topped off with a black beanie. Alexis approached a group to ask them what was the plan for the day and where they were coming from. After a young girl told her they were there for an “action” she was immediately told in urgent language to go away by one of the older looking girls who stepped in and seemed to be in some kind of control. Not long afterwards the order went out and streams of Nashi began marching towards the Kremlin. We follow them and track down a lone Nashi who has been separated from his group while just outside the East entrance to Red Square. In the awkwardness of his youth he tells us he is from Belogorskaya, which is just as far from Moscow as is Berlin, and that this is his first time in the capital. He excitedly tells Alexis there is a concert in the evening, and that we should come out for the good time. When Alexis asked another Nashi if there will be anything the following day the response was no, that we should go out tonight instead as there is nothing of importance the following evening. 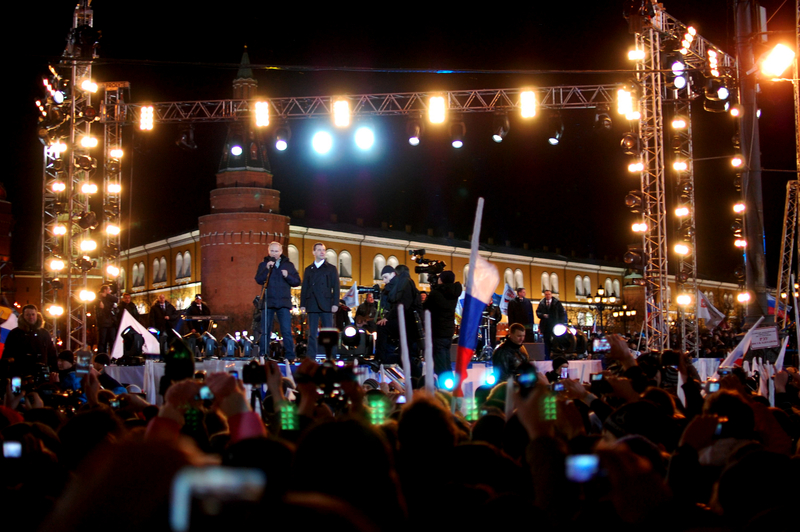 The following evening Alexis and I attended the March 5th opposition rally in Pushkinskaya Square. When we arrived the square was jammed with a diverse representation of Muscovites, with right-wing nationalists chanting (not quite side-by-side) with active members of the gay community. The rather unpopular former chess grandmaster Garry Kasparov spoke along with Gennady Zhuganov, the head of Communists, billionaire Mikhail Prokhorov, ‘The Russian Paris Hilton’ Kseniya Sobchak, and most popularly the political blogger Alexei Navalny. While coming together in chants for a “Russia Without Putin” many cheered on their favoured speaker by waving diminutive flags in the chilled air of yet another frozen night. Just like at the pro-Putin rally we passed through checkpoints of bomb detectors and saw rows of riot police waiting on the edges. But there was a marked difference from the previous night as here people were full of energy, yelling out demands, passing out political tracts, meeting up with one another in animate ceremony, enthusiastically repeating the slogans emanating from the stage and feeling the crush of a fomenting mass. 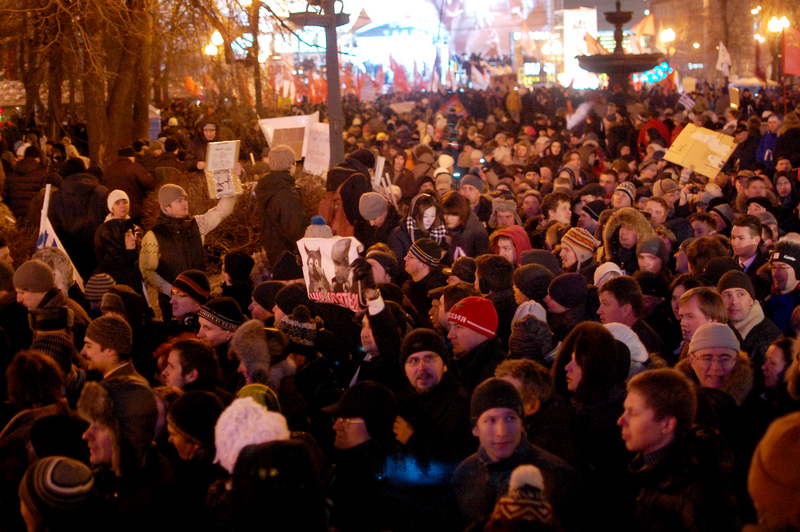 Opposition rally in Pushkinskaya Square. 5 March 2012. Moscow, Russia. (Photo: Nicholas van Beek). Attendees of the Putin rally were organized according to quadrants, with someone in charge holding up a numbered sign as if leading a group of easily lost tourists through the Tretiakov gallery. Walking through the crowd was easy. There were large pockets of open space as the group didn’t seem to cohere except for in the moments where Putin and Medvedev were announcing victory. Here at the opposition rally people were organized by the apparent powerlessness of their political ideals with frustration, critique and anger funneling into the spectacle from all locations of discontent. 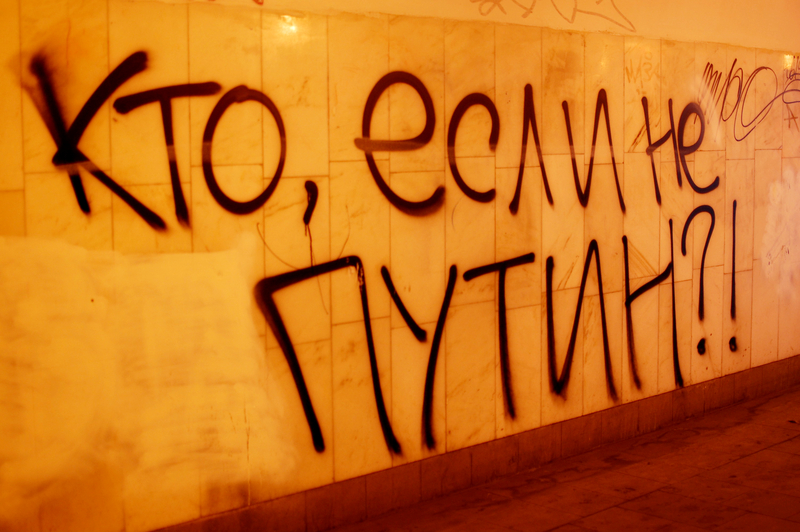 Later in the week we went to the house of a prominent Moscow graffiti artist and he expressed a common sentiment when speaking of the opposition movement. Despite the flag waving, the energy, and a reinvigorated public discourse, he saw in the opposition but another actor in an insubstantial political realm, in which brands jostle for positions of power over a problematic and often dangerous social environment. Distrust characterizes his view as he asked “who is Navalny?” when discussing the prominence of opposition figure Alexei Navalny. He pointed out that Navalny has no substantial political program but has simply written about corruption on his LiveJournal blog and otherwise expresses many incompatible political opinions. His popularity shot up in a vacuum, which was created by the many creative ways Putin kept legitimate candidates out of the race. 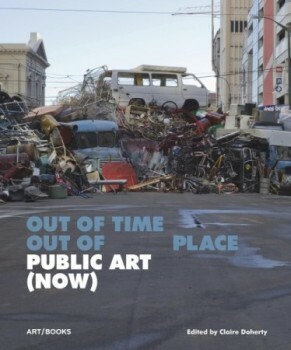 The artist echoed the popular belief that Russian society is in need of reformation rather than a simple change of images in the political system. Russia would always be corrupt and undemocratic as long as Russians enabled it to be and he feared what else could emerge from such a society other than Putin. 5 March 2012. Moscow, Russia. (Photo: Nicholas van Beek). In another interview with a Moscow Professor of Economics the spectrum of fear was expanded. She saw the Egyptian Revolution and continued unrest throughout the Middle East as the result of precise American intervention and Navalny as a provocateur who was, according to her, recruited by the CIA while attending Yale. These dedicated movements of unrest, which include the Russian opposition movement, are not spontaneous pushes for dignity and democracy by oppressed peoples, but rather part of a program designed to create instability in the world system. Global instability, she argued, is a planned necessity for America to recover economically and politically from the myriad of forces currently eroding its power. But far more deeply than that, she used the ideas of J.W. Forester, the founder of System Dynamics, to explain how our era itself is coming to an end. Due to rising populations, the excesses of industrial society and finite resources, a continuously increasing stress is exerted on our economic, social and political systems – which she sees as in the early to mid stages of imminent collapse. In the 1970s Forester used a cybernetic model of human society to predict that by 2100 our world system would exhaust itself entirely. If you input current data into his calculations, which use a feedback loop model to depict energy flow through the world system, collapse will occur much earlier. While she discussed this, the second episode of the Adam Curtis documentary All Watched Over By Machines Of Loving Grace came to my mind. Curtis discusses the role Forester played in shaping the cybernetic view of the world, in which humans exist as a computer would see them. Unchanging, invariable nodes of consumption and production “acting and reacting to flows of information,” who are shaped by systems and feedback loops. Systems Ecology developed partly out of his work and helped solidify the powerfully imbedded idea that human society must be controlled in some form by the organizing principle of promoting system efficacy. Otherwise, consumption and production would eat up what is left of our concept of nature as the human organism disrupts an assumed ecological balance and engulfs what is left of the earth. Though she saw Putin as a corrupt politician and even as a kind of running bad joke she saw in him a safeguard against something far more terrible – the outbreak of social chaos in the wake of a collapsing global system. For her the ideal of democracy, the constituted liberal conceptions of rights and the middle class to which she belongs were all teetering and soon to fall from the heights of our inflated civilization. She used the ideas of Forester to argue that what is forming in Russia and other societies are traces of a new era in which inefficiencies, such as what she defines as “moral degradation” (eg. drug use, gay culture), and social welfare will no longer be tolerated in an emerging form of neo-fascism. She is not a neo-fascist, but has no confidence in the ideals of a “self-organizing system” as discussed by Curtis, and does not see a viable alternative to the increased efficiency economic, social and political institutions would supposedly gain from right-wing authoritarianism. Though this sounded overly simplistic and laced with paranoia she is nonetheless a relatively prominent professor and even uses her lectures to discuss these ideas with her class. In the week following the election she told me that after lecturing about her thoughts on the world system and the role of American intervention she was sure that many of her students went to the polls on March 4th and voted for Putin as a result. Many iPads were in hand to capture the action. 5 March 2012. Moscow, Russia. (Photo: Nicholas van Beek). 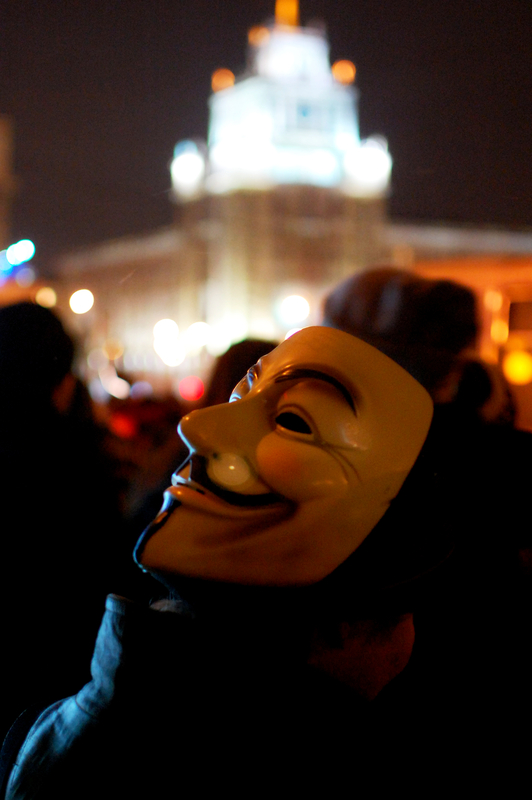 Centralized authority manifested itself when the March 5th opposition rally ran out of time. 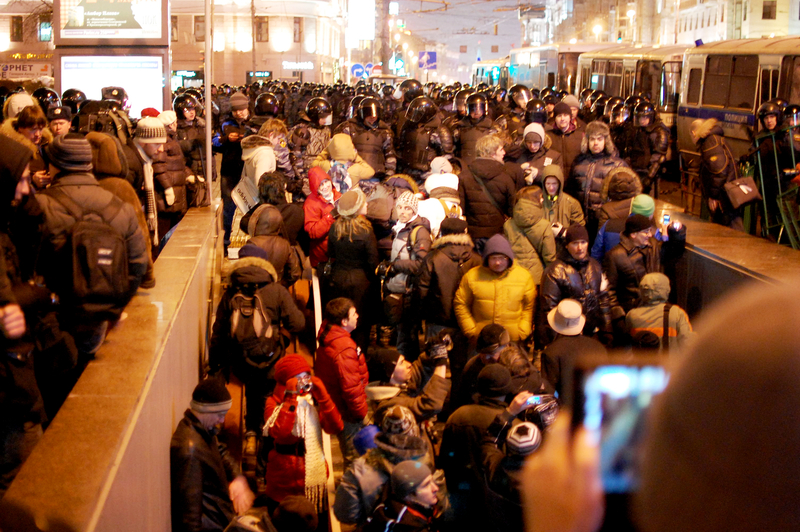 The permit they had been granted ended at 10 p.m. but many demonstrators stayed behind and were forced by police into a tunnel running under Pushkinskaya Square. The riot police soon forced them out of the tunnel as well and off the surrounding streets, reintroducing a steady flow of Moscow traffic to jam the area full of fast moving cars, which cut up the crowd in sections easily digestible for authority. The crowd reacted by spilling onto Tverskaya street, chanting “Russia Without Putin!” and marching north towards Mayakovskaya Square. 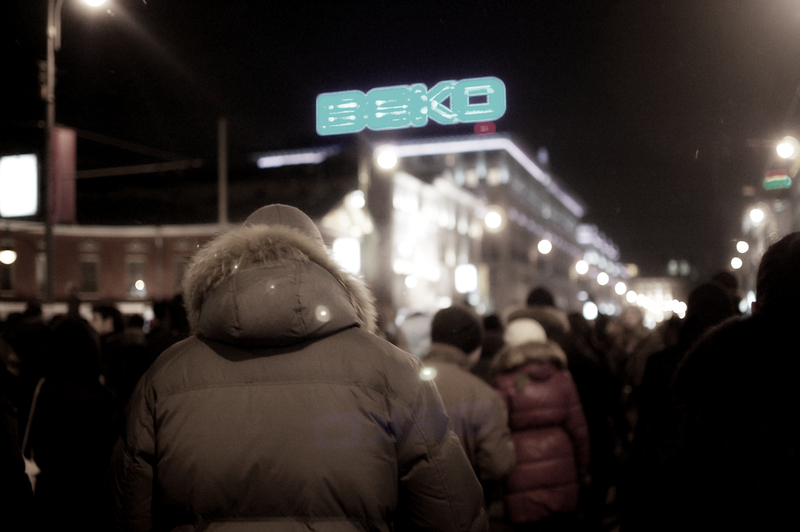 Tverskaya Street march. 5 March 2012. Moscow, Russia. (Photo: Nicholas van Beek). Police buses zoomed next to us and stopped, flooding the sidewalk with body-armoured riot police who swarmed around marchers and began pulling them and any passer-by into the buses. While photographing the scene I was grabbed from behind and was dragged towards an open bus door. Noticing the split-second grab, Alexis screamed out “On Americanskii! Americanskii!” at the police, causing a lieutenant to order my release. The protesters kept marching up the street and the police kept dragging them into buses, arresting Navalny in the process and dwindling their numbers until those who remained disappeared into the city. All Watched Over By Police Of Loving Grace. 5 March 2012. Moscow, Russia. (Photo: Nicholas van Beek). Many of the conversations we have had with politically-minded Muscovites contain traces of a distinct form of apathy deeply rooted in fear. 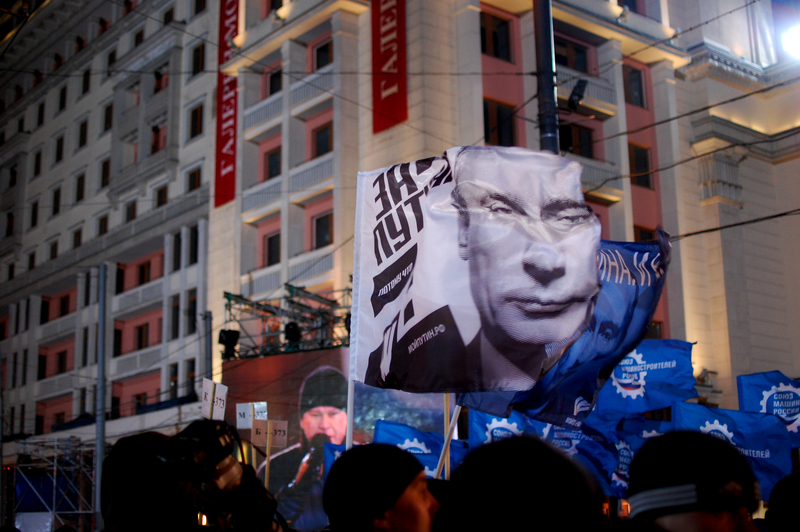 Educated, engaged and often young members of the ‘new middle class’ who unquestionably oppose Putin fear not only a return to the economic and social dislocation of the 1990’s, but they fear Russian society itself and believe social, individual change is the key-stone and a prerequisite to changing the distribution of power. Within this perspective even the apparent enemies of Putin have been de-politicized by a fear of any change which may disrupt the system. 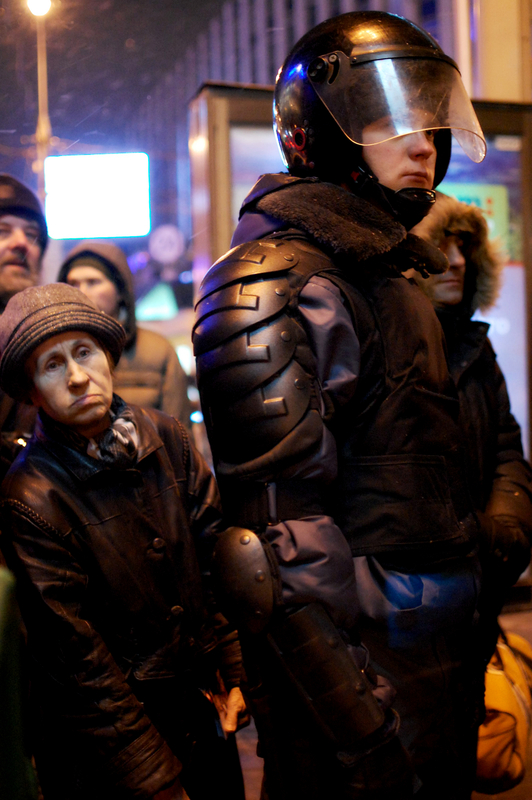 It is difficult to imagine a Russia without centralized authority, one who is exposed to global machinations and internal populism, but worst of all one who is ‘weak.’ Platforms and visions for alternate futures are in short supply and lack traction while anti-establishment public personas and contrarianism have been cultivated as the primary form of opposition. This cynical defeatism co-opts even those who hate and vote against Putin as they believe in and sustain a world in which he is king and ‘managed democracy’ remains legitimate. Our friend Katya described why she is optimistic. As a young activist she sees hope in the increased representation members of the opposition gained in the State Duma, seats which were won in largely flawed elections. She sees this as an opportunity to lobby politicians, some of whom are her friends, and to work with them to bring progressive ideas as simple as recycling programs into the fore of political discourse. Though this is not as romantic a vision as usually gains popular traction it is nonetheless a perspective which allows for political mobilization in spite of social paranoia and an uneven distribution of power. It may just be the only way out of the shadows. Excellent report that gets into the election that was largely ignored by Western media. The stories are captivating and shed some very interesting light on what appears to be a democratic election but what clearly is something staged on a grand scale. This should be submitted to the Atlantic! Hello from Korea! Yes, I’m checking blogs what else would i being doing dunrig our 4 hr layover?! lol.This post is so cool and timely for me to read. We are about to meet blog friends who are staying at the Vlad Inn while we are there. I love the idea of being able to keep in touch!